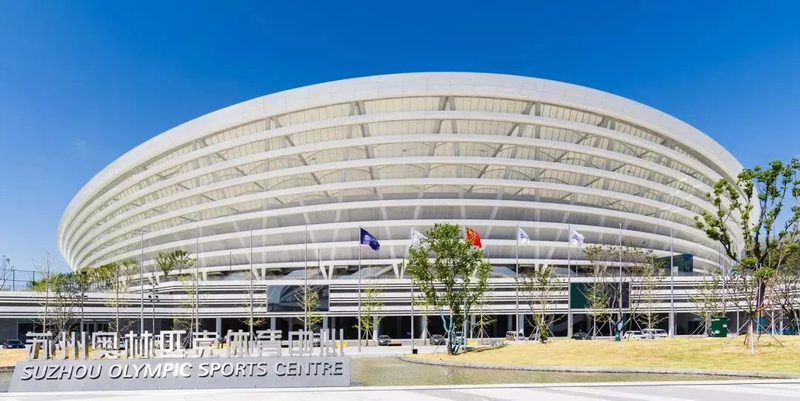 As China's cities are expanding dramatically fast, so are new sports complexes – popping up across the country. Here the capacity of 40,000 or complex size of 50 hectares is no surprise. 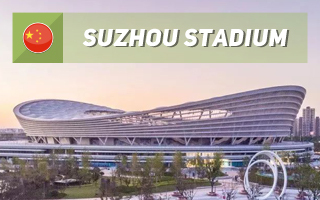 However, we still consider the Suzhou Olympic Sports Centre a true gem! Early into the 21st century, this stadium's site was still a piece of large farmland. Already then, however, a strong grid of wide avenues was being created in a joint project between Suzhou and the government of Singapore. Named the Suzhou Industrial Park, a brand new district for up to 1.2 million residents was created east of the Jinji Lake, by 2018 almost entirely complete. By that time the single largest public recreation area was already the Olympic Sports Centre (OSC). 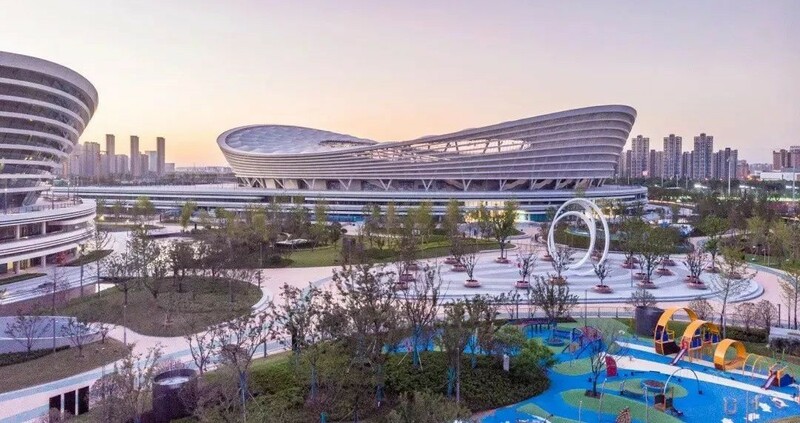 Planned as the rising metropolis' main sports precinct for both professional and amateur athletes, the OSC covers some 50 hectares, nearly 60 with adjacent green areas and canals. 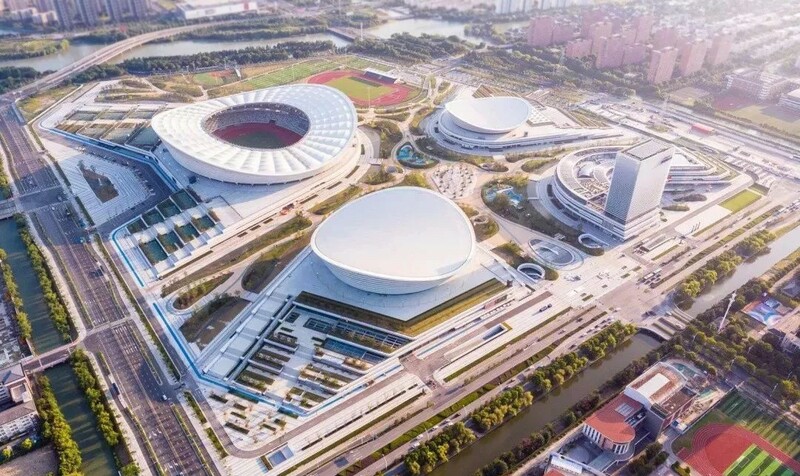 As is customary in China, the complex comprises of three main sports buildings: main stadium, main indoor hall and main natatorium, all comprising training infrastructure within their floor space. The fourth major element is the complex's office building. Together the buildings offer gross floor area of over 421,000 m2, of which over 150,000 m2 is placed under ground. The office tower, conjoined with a shopping centre, houses a 269-guest hotel, casino and other amenities for both sport-event visitors and everyday users. While the tower is by far the tallest structure of the complex, it's not the dominant one. This role belongs to the main stadium, spanning over 250 meters (north-south). Despite such scale it's visually (and literally) very light. Supported by slender V-shaped columns, the compression ring reaches peak at 52 meters above ground level. The facade is covered by an ultra-white low-radiation glass curtain wall and a horizontal white visor. The wavy cladding provides shade inside in the summer and limits wind access, while assuring proper ventilation. It thus proves energy-saving. Also kept in white and mimicking the main venue are two other sports arenas. Both the indoor hall (13,000 seats, height of 42m) and the natatorium (3,000 seats, height of 32m) are seddle-shaped, providing a dynamic but not imposing intervention in surrounding landscape. From afar the complex may resemble gentle hills and this interpretation should be possible also for pedestrians approaching it at touching distance. When entering from main access routes (two light rail stations are connected), visitors are welcomed by lowest points of the complex, just two floors above ground. The height steadily increases as they move towards the heart. When entering one of the main venues, visitors climb cascades of stairs to reach the plinths upon which all three seddle-shaped arenas rest. From that point a great overview of the entire park is enabled, regardless from which side the spectator came. When entering the complex through shaded park pathways, visitors get the impression of entering a gentle canyon as the venues grow. In total the white terraced buildings should give a harmonious impression, inspired by traditional Suzhou gardens. 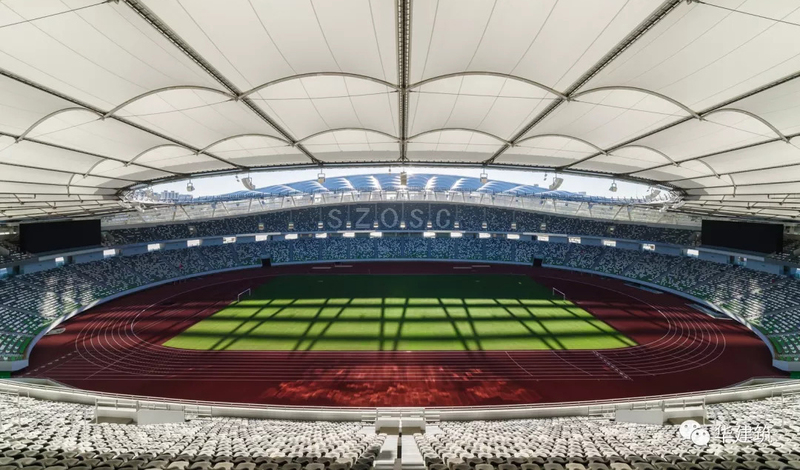 The main stadium's layout is very traditional, especially as the tensile cable roof structure becomes commonplace in stadium design. That said, this is China's largest single-layer radial ring-cable system. While ensuring all 40,000+ spectators are covered, the roof's cable structure weighs just over 500 tons. While not much for a web of this size, it surely was a logistical challenge when transported from Switzerland.